Today we’d like to introduce you to Ann Voorhees Baker. Ann Voorhees, can you briefly walk us through your story – how you started and how you got to where you are today. It was over a decade ago. I was turning the big five-oh, and I was in the midst of a divorce after twenty-three years of marriage. There had been strife and tension in my life for many years. Socially, I’d been in a lay-low mode for a long time. I had friends, I went to gatherings of people I knew well, but I wasn’t exactly a social hobnobber. Nah, no one was going to throw a birthday party for me. So I decided to throw one for myself. Not with glitz or high heels or streamers or fancy food or cocktails. It would be a celebration of myself. My style. I was living in Northeast Ohio at the time, and I rented a cabin in the woods. I invited a dozen girlfriends and asked them to bring food & wine, CDs, videos, candles, and walking shoes. I said I didn’t want to go antiquing or out to restaurants or on any shopping expeditions of any kind. Just hang out, listen to music, talk, take walks, cook, chill in the hot tub. Get up for the sunrise. Sit on the porch at sunset with a glass of wine. Fifteen of us gathered – some from my group of Shaker Heights, Ohio friends, some from far away – friends from my earlier days living in New York City. A few came not knowing a soul other than me, but everyone was willing to take the leap and spend the weekend together. All of us loved the prospect of spending a no-kids, no-husbands, no-make-up, no-errands weekend away from day-to-day life. A weekend just for us. The experience was grand. Any conversation that happened was open to anyone; there was no breaking off into pairs or cliques. We talked a lot; we went off alone here and there for a time to ourselves. We took a long hike in the woods and came back good and sweaty. We mixed margaritas. We shared our food and took turns cooking and cleaning up, without any need to ask, discuss, or bargain. And on the second night, I lit all the candles and brought out a little basket into which I had dumped a handful of folded slips of paper. I held it out. “These are questions I’d like to pass around the table. If you pick a question you don’t want to answer, just put it back and get a different one.” A few women looked very close to rolling their eyes, but they went along anyway. During the next few hours, some women shared hilarious stories from their younger days. Some shared dreams they’d let go by the wayside. Some shared stupid things they’d done that should have left them dead. One woman who’d abandoned her painting years ago came close to tears that evening. “I didn’t realize how much I missed it,” she said. I talked about the problem that had plagued me all of my life – chronic tardiness – that the group, and everyone else in my life, had always teased me about. I shared the embarrassment it had brought upon me, the efforts I’d tried to cure it, and the terrible consequences it had sometimes caused. Another revealed that she was really at the point of desperation, looking for a new job. All in all, it was a low-key weekend. Casual. Free-flowing. An escape. No real agenda. Yet it actually changed the course of a few lives. The woman who’d given up her art got out her painting supplies when she got home, set up a little studio area for herself, and started painting again. I found myself continuing to think hard about my lifelong problem with lateness; that my life, and those of my children, had been severely affected by it. It wasn’t just an annoying character trait of mine; it was a serious problem that I hadn’t been able to correct in 50 years – why? I’m now writing a book about the subject. The woman who needed a job was recommended by her friend whose place of work had an opening, and she got the position. So did all of these things happen because of what I did? No. The revelations happened and encouragement and help were given and changes occurred because of the women who were there, because of their willingness to share their true selves, and most of all, I think, because of the support they received from the rest of the group. That’s what’s behind Women At Woodstock (womenatwoodstock.com) – the desire to bring like-minded women – women of experience, together – women who want to know themselves better and share what they may and give and get support from one another. It is more structured than just that; we have workshops and yoga and an engrossing mastermind session (and fabulous healthy food and wine and cheese and chocolate!). But at the bottom of it all, the essence of it all is that we have each other. And that’s where the power of the experience lies. By the way, I’m not a professional event organizer. I’m actually a writer and web designer by profession. (annvbaker.com) I produce Women At Woodstock every year because I really love to return to the northeast every autumn to share a communal experience with other “women of a certain age” in the beautiful Hudson Valley when all the leaves are red and gold and the air is crisp and cool. The fresh air, the earthy smells, the expansive views, the quiet; getting away from it all, back to nature and back to our true selves, rejuvenates us all. 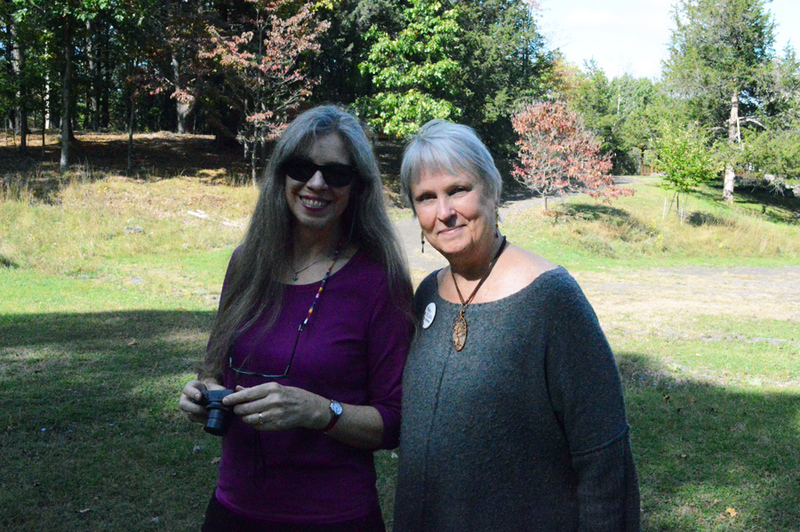 Women At Woodstock started as an idea that kept cropping up in discussions with my writing and web design clients; women from all over the country. 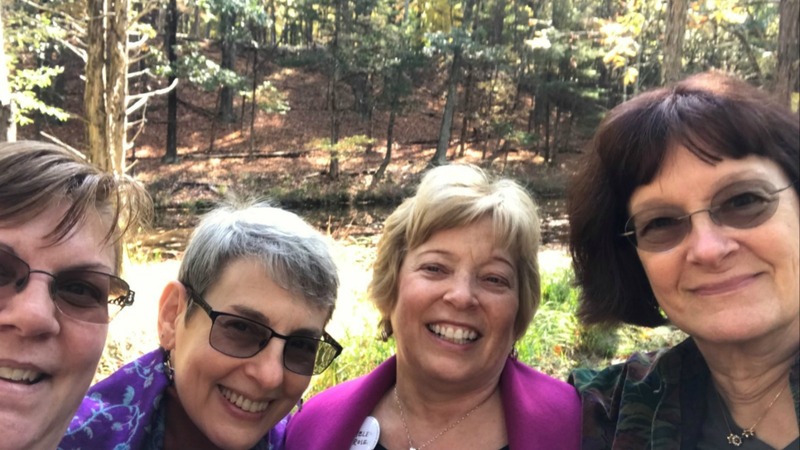 I kept talking about wanting to hold a conference/retreat/networking event for women in midlife – one that would be low-key and an escape from pressure and competition. The response I always got was not just favorable; women kept saying to me, “You’ve gotta do it – and let me know when you do because I’m coming!” So with no background in event production, I went for it, and it’s grown pretty naturally. I don’t really advertise; I write a regular blog on the Women At Woodstock website and I post to social media, and that’s really how I attract women to the events. 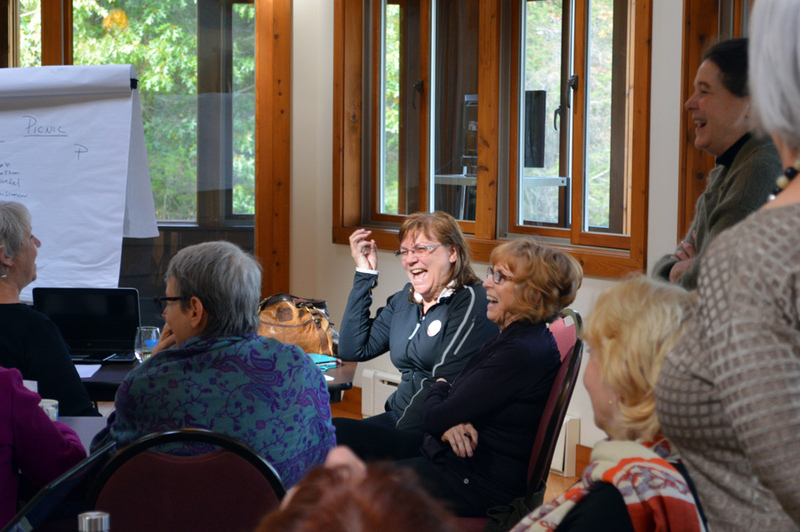 I say “events” because there are actually two different gatherings every October – a 4-day workshop weekend; and then, separately, a 4-day writers retreat. Women who attend seem almost destined to join us. There’s always a diverse group – businesswomen, entrepreneurs, professionals, retired women, writers, and artists; yet there’s always harmony among us. It’s amazing how much we feel like sisters at the end of our stay together. That being said, I’ve made some mistakes. 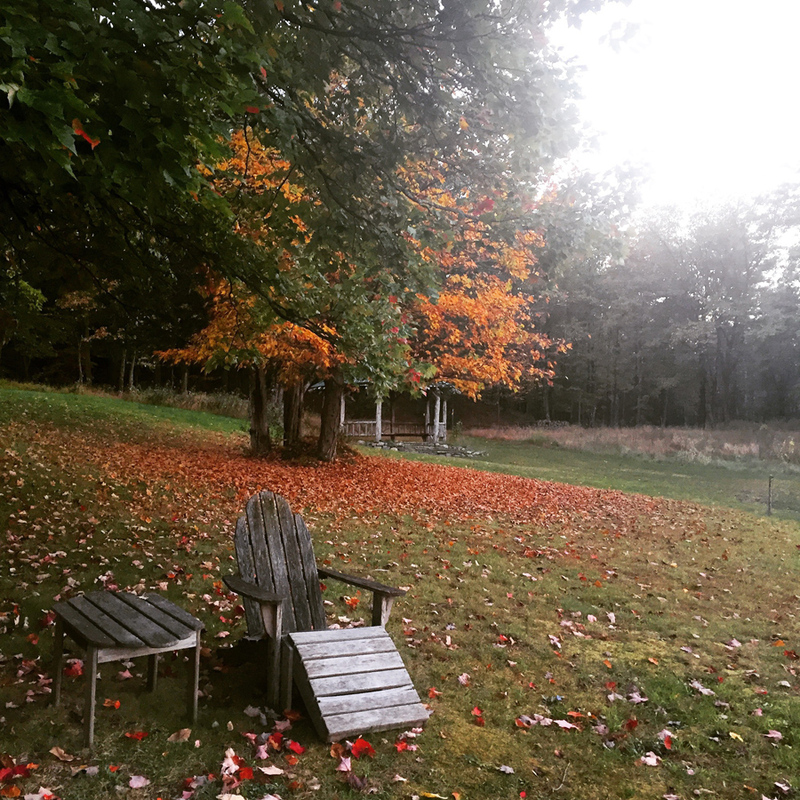 I added an event on the west coast several years ago; it was a good gathering but it just didn’t have the right feel; it wasn’t isolated enough, it didn’t have that sense of impending change that autumn in the northeast brings. Then I tried in a later year to add an event in the south in the spring. Not only was that, again, not the right “feel,” but I learned a little something about demographics; Women At Woodstock, for whatever reason, is not a good fit for most southern women. I kind of lost my shirt on that one. 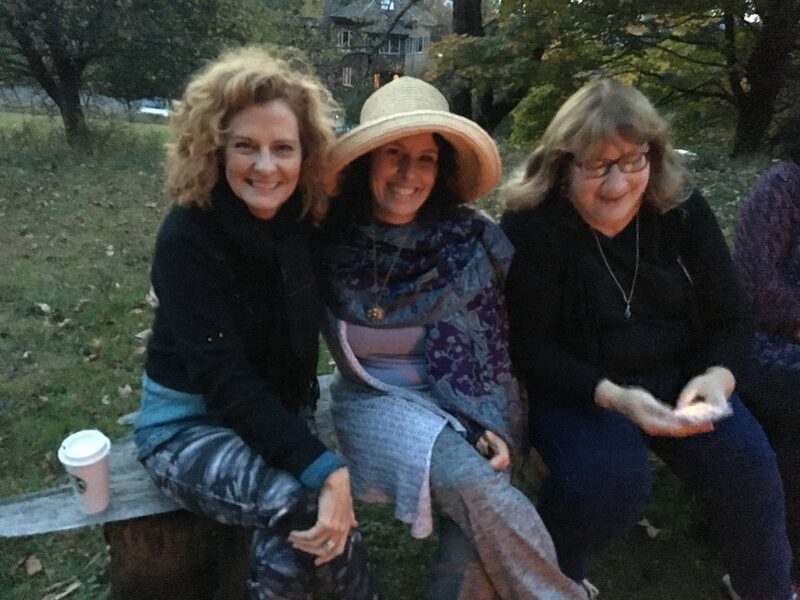 I’ve returned to my original vision; a gathering of women every fall in the woods just outside of that iconic place of peace and possibilities; Woodstock, New York. 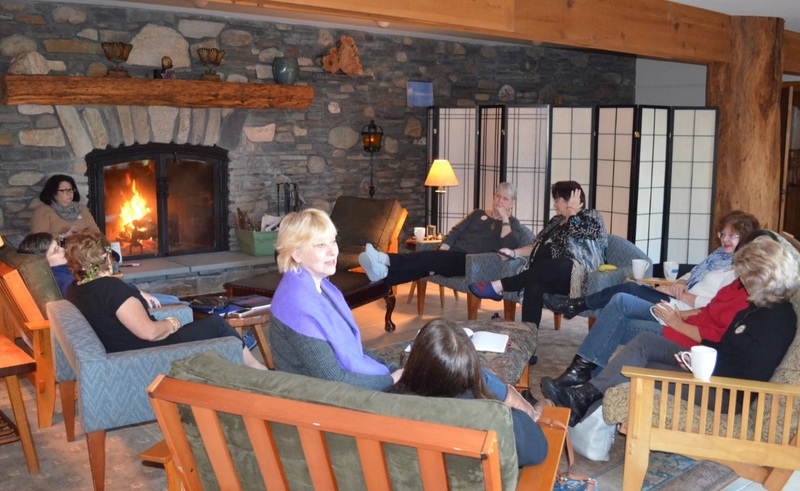 One retreat for workshops and networking; a second retreat for writers and writing. What I’ve learned is that the setting fits the women and the women fit the setting, and I shouldn’t mess with it. Women At Woodstock is natural and free-flowing and creativity-inspiring, big on sharing and friendship, and yes, slightly hippie-ish, though we don’t sing kumbaya or get stoned and dance in the fields. We DO live communally during our time together. We do adopt an eco-friendly style of living. At the end, many of us say that we haven’t felt so much “ourselves” in a very long time. And on our last night, it’s our tradition to gather in a circle outdoors and pass a burning sage bundle while we state our wishes and goals for the coming year. And on that last night, my wish is always the same: To have the good fortune to return the next year to connect and share once again with my growing circle of friends, old and new. I hold a retreat that doesn’t fit into any mold. 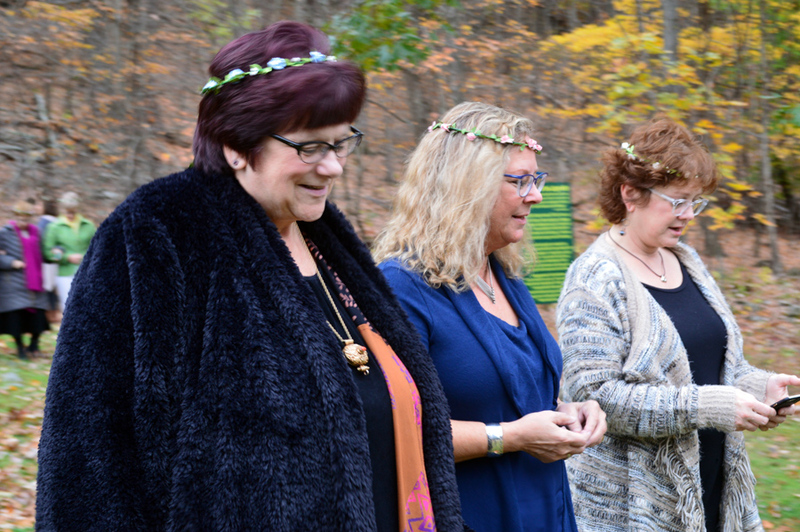 It’s a little bit girl scout camp, a little bit high-powered networking, a little bit learning and exposure to new ideas and information, a little bit sensitivity session, a social event and an escape to solitude all at the same time. After seven years of such gatherings, I’ve witnessed several women make earth-shattering changes in their lives – some professional, some creative, some quite personal. Alice lived many years in New York, working as a character actor. (“If it was a cop or medical show, I had a bit part in it somewhere,” she says. She appeared on Law & Order Criminal Intent, Blue Bloods, Shades of Gray, Zoe, and many others, “usually as the hard-edged attorney on the losing side.”) Her apartment in The Village was in a choice location and had its own private garden. She brokered real estate to cover her bills in between gigs. In many ways, it was a dream life – except, as she shared at the 2012 mastermind session, she had always wanted to be a screenwriter. She returned in 2013, her life unchanged, and she shared that wish again. As they had in the previous year, the women at the event encouraged her, and some kept in touch with her throughout the year. Finally, she decided to apply to film school, and she asked some of these women for letters of recommendation. She was accepted to Columbia’s Fiction Writing graduate program and Chapman Film School. She attended Chapman as the oldest student in her class, graduated in 2016, and is now what she dreamed of becoming: a screenwriter. Linda had written for years for About.com and other major publications and informational websites. Previous to her writing career, she briefly hosted a local television show and a local radio show. Now she wanted to get back to radio, this time as a host of a regular segment on NPR, but she was not confident about pitching the show she envisioned, though she had gotten as far as scheduling a meeting. 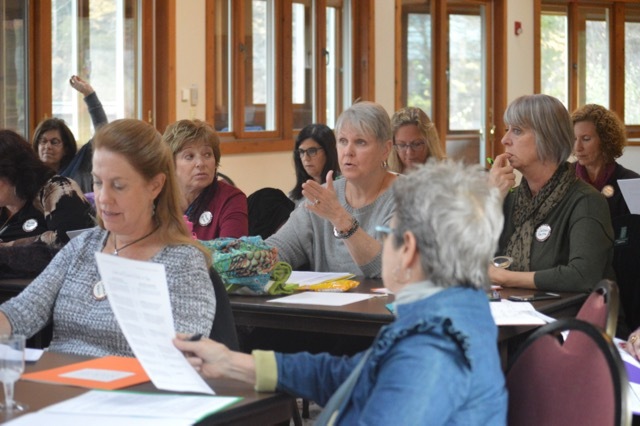 When she mentioned her plan at the Women At Woodstock mastermind session, a business coach pulled her aside afterward and talked her through the pitch, then asked her what compensation she was going to request. When Linda answered, the coach said emphatically, “No, you’re not. 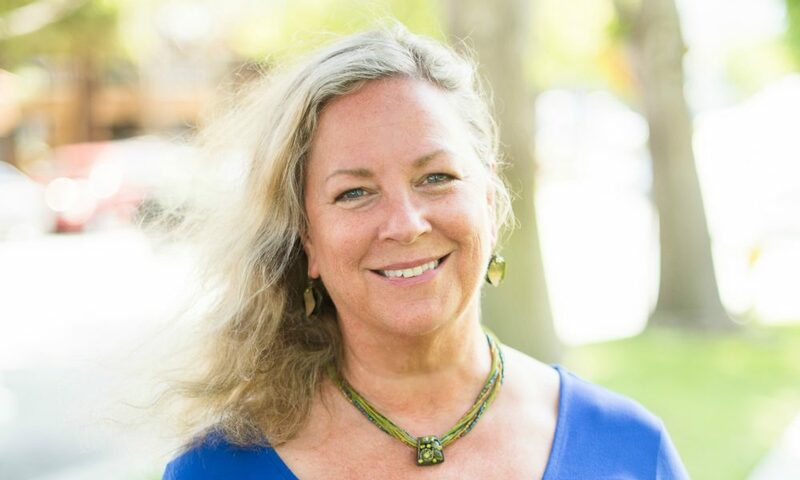 You’re going to sit on your hands and wait for them to make an offer to you.” Linda ended up successfully pitching the show and received an offer of 10 times what she had planned to ask. She went on to co-host a weekly show on NPR which did well regionally and was syndicated to other NPR stations across the country. Karen was one of the most bubbly, upbeat women in the Women At Woodstock community, but after attending Women At Woodstock for four years, she dropped a bombshell on the group; the husband whom she always lovingly referred to was in fact not her husband – he was married to another woman. Karen burst into tears as she explained that her partner’s wife had claimed for twenty years that she was disabled and unable to work, and he had felt so guilty that he’d continued to support her. Sobbing, Karen said she had been living a lie to the world – including her two children – and she was fed up with the lies and the drain on their finances. Amid the compassionate responses that followed, an estate and probate attorney in the group pointed out that, contrary to what Karen and her partner believed, the wife could collect social security benefits based on the husband’s earnings even if they divorced since they had been married for over 10 years. Karen went back home and, strengthened by the support she’d received and the information she’d learned, confronted her partner with the pain this was causing her. To her amazement, he actually seemed relieved to be forced to face the situation, and finally, he filed for divorce. Karen is now freed from the financial and emotional burdens she’d been living with for twenty years. There are so many more stories. But these give you an idea of what happens at Women At Woodstock. People aren’t brainwashed; there’s no teaching of some sort of “right” way to live or the perfect set of beliefs to adopt. It’s the honesty, the sharing, the collective intelligence and wisdom of the group, and the compassion of these seasoned, wise women who come together, that brings women out of themselves, back to themselves, and into a group of friends who they truly feel “have their back.” Many who attend say they feel that they’ve finally found the tribe they’ve always longed for. Well, I guess I’m unusual in that I work all year here in the South Bay, and then I hold an event on the opposite side of the country. But here’s what’s so great about being based here: the weather is easy and lets you enjoy the outdoors all year long. The people – in the South Bay, anyway – are mellow and low-key; you can go out in a dress or yoga pants; high fashion or no fashion, and nobody gives a damn. And even though just about every outing requires a car, the act of driving is low-stress; nobody honks! Often when my east coast friends visit and we’re out and about, they remark upon this wondrous phenomenon – that we are negotiating through traffic with fellow drivers who are for the most part courteous, laid back, and forgiving of small errors and misunderstandings. A wave or a smile is the most likely result of a hang-up over who-goes-first at a boulevard stop. I hang out often in local coffee houses to ghostwrite a book, research blog posts, write web content, work on a new website design, or blog about Women At Woodstock; around me are similar solo souls working at their laptops, sipping coffee and enjoying both the communal feel of the place and their own personal solitude, as an ocean breeze sifts through the space that we’re sharing. The South Bay is a really great place to live and work. I feel very grateful to be here. I went to my first Women at Woodstock weekend two years ago not knowing a soul. 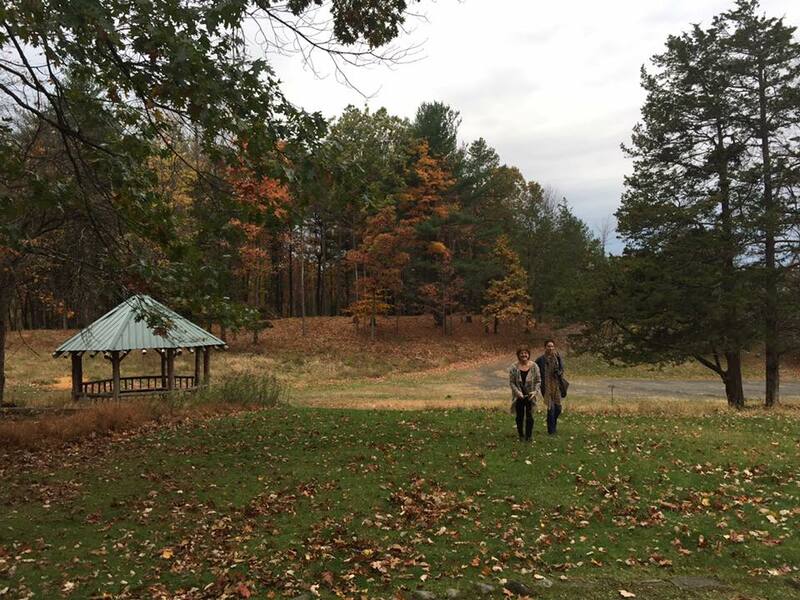 My hope to meet a nice group of women and enjoy a relaxing and fun weekend in the country was more than met! I’m so grateful to Ann for setting up this special event and keeping it going year after year. I’m going back this year, and bringing a college friend with me so she and I can reconnect with each other along with all the new people we’ll meet. It’s a really special experience….